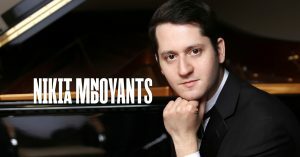 Coming from a family of professional musicians, NIKITA MNDOYANTS began to play piano and compose music at a very young age. He entered the Central Music School in Moscow, where he studied piano with Tamara Koloss. He gave his first public recital at age eight, and recorded his first CD (of a live performance in Helsinki) at age ten.